It looks like a Slinky suspended in motion, but this metamaterial hyperlens doesn’t climb down stairs. Instead, it improves our ability to see tiny objects and could one day help detect lethal forms of cancer. It could also lead to advancements in nanoelectronic manufacturing and boost scientists’ ability to examine single molecules—a development with implications in physics, chemistry, biology, and other fields. “There is a great need in health care, nanotechnology, and other areas to improve our ability to see tiny objects that elude even the most powerful optical systems. The hyperlens we are developing is, potentially, a giant step toward solving this problem,” says Natalia Litchinitser, a professor of electrical engineering at the University at Buffalo and lead author of a paper describing the technology in the journal Nature Communications. Metamaterial hyperlenses overcome the diffraction limit by transforming decaying evanescent waves into propagating waves. Once converted, the former decaying waves, which were commonly lost in conventional imaging, can be collected and transmitted using standard optical components. Some of the first metamaterial hyperlenses consisted of tiny concentric rings of silver and dielectric (an insulating material). However, this design only works within a narrow range of wavelengths and it suffers from large losses of resonance. Instead of concentric rings, Litchinitser and colleagues formed tiny slivers of gold and PMMA (a transparent thermoplastic) into a radial shape. The design of this metamaterial hyperlens, which looks like a Slinky suspended in motion, overcomes the diffraction limit in visible frequency range. Moreover, it can be integrated with an optical waveguide, opening the door to hyperlens-based medical endoscopes. More studies are required, but such a tool could improve doctors’ ability to detect some of the most lethal forms of cancer, such as ovarian cancer. For example, today’s high-resolution endoscopes can resolve objects to about 10,000 nanometers. 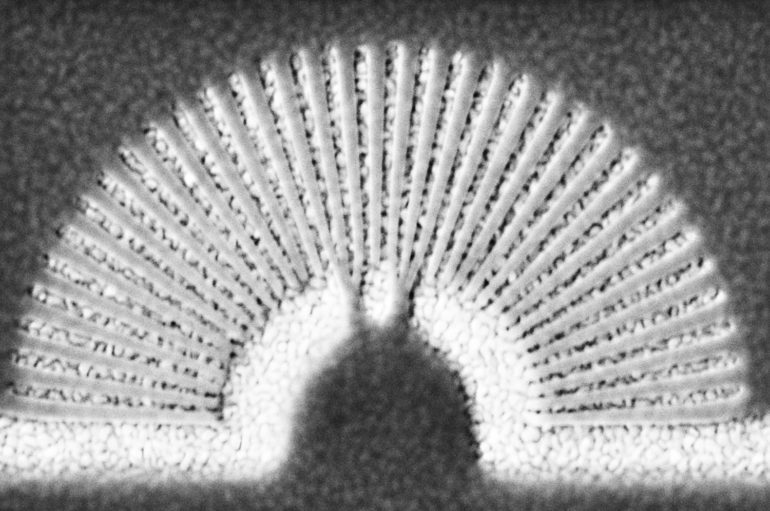 The hyperlens could improve that to at least 250 nanometers or better. This is important because the earlier doctors are able to discover hard-to-find cancers, the more success they have treating the disease. Another potential application centers on optical nanolithography, the process of passing light through a mask to a pattern on polymer film. Continuous improvement in this field is essential to building the next generation of optoelectronic devices, data storage drives, sensors and other gadgets. The hyperlens also show promise in sequencing single molecules, a potential advancement with broad implications in numerous fields of research including physics, chemistry and biology. Grants from the US Army Research Office and the National Science Foundation funded the work.